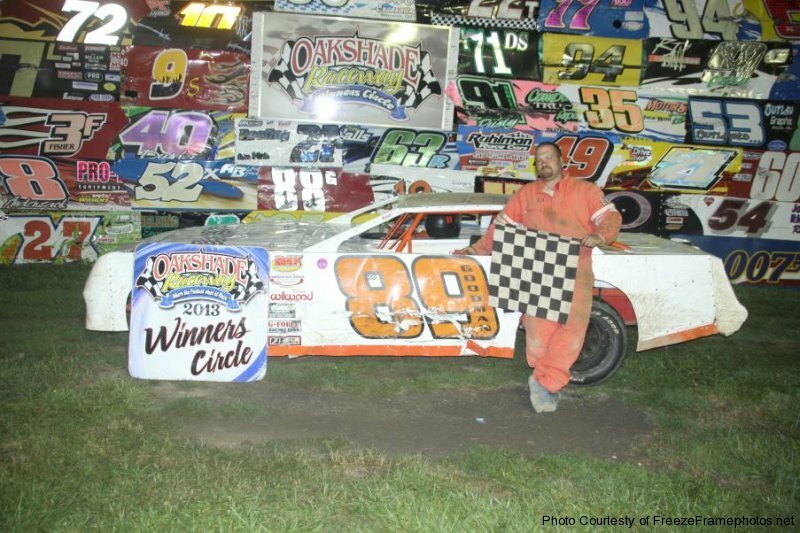 Thirty-three Sportsman drivers showed up for a chance to compete in the Sportsman Twin 25’s at Oakshade Raceway on Saturday night, but only one driver, Tim Line, would sweep both 25-lap feature events. Line started seventh in the first feature race and quickly worked his way up to second by lap four. With Joe Derbeck leading, Line was able to get along side to race for the lead. Just as Line made the pass, the caution flag flew for the stopped car of Drew Smith which gave the lead back to Derbeck. Shortly after the restart, Line took command and began to pull away. A few cautions late in the race kept tightening up the field with Derbeck in second, but Line was the class of the field and went on to pick up the victory. 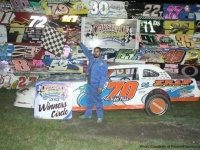 Bob Krumm got by Derbeck to post a second place finish with Jim Scout and Bob Gregory rounding out the rest of the top five finishers. The top six finishers were inverted for the start of the second 25-lap feature which put Line on the outside of the third row. Bob Gregory looked strong at the start of the race and led the first six laps, but Line quickly marched his way toward the front once again. Line climbed back to second by lap five and then briefly took the lead from Gregory on lap seven. Gregory fought back and reclaimed the lead one lap later. Line regrouped and the battle for the lead heated up with some side by side racing. Finally, Line took the lead on lap 17. 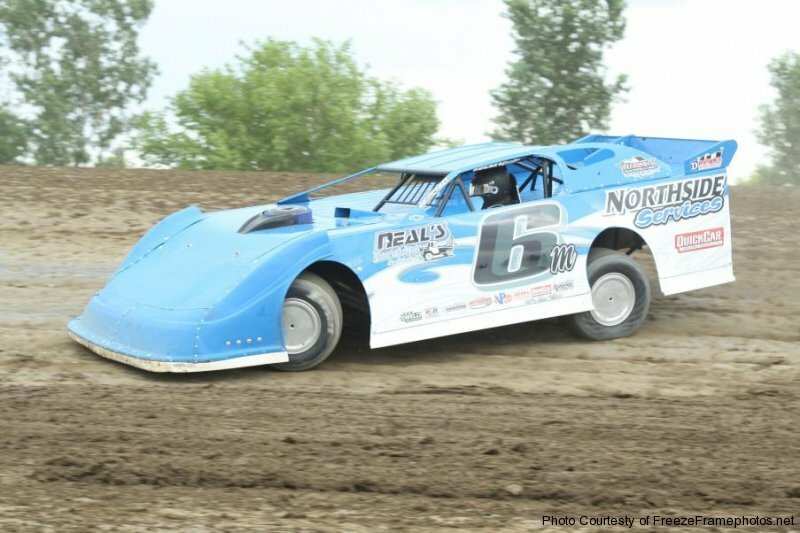 Bob Krumm came back into the picture late and closed in on Line on the final lap. He dove to the inside of Line in the final corner. 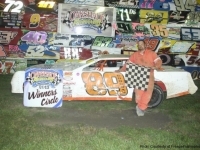 It wasn’t enough as Line held on to win for the second time on the night and it was his fifth feature win of the year. Krumm settled for the runner up finish once again. George Lindsey finished third and Bob Gregory slipped back to finish fifth. Mike Jessen started 17th and ended up fifth. The top three in Oakshade Raceway UMP Late Model points put on a great show at the front of the UMP Late Model feature race. 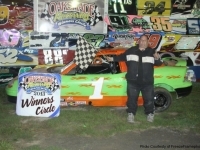 Rusty Schlenk, second in points to Dona Marcoullier, grabbed the lead at the start after starting inside row two. Marcoullier made an incredible move three-wide between Schlenk and Curtis Deisenroth to take the lead on lap two. Schlenk fought back and got the lead again on the following lap. Ryan Missler, third in points, peaked in the second position on lap five moving Marcoullier back to third. On lap 16, Schlenk held the lead and was trying to negotiate around Joe Smith who was running at the tail end of the lead lap. Schlenk was having some difficulty getting by Smith which allowed Marcoullier in second to close back in. Finally, Schlenk got to the inside of Smith entering turn three and it appeared there may have been some slight contact as Smith shot up the banking and came to a stop to bring out the yellow flag. Marcoullier took advantage of the double file restart and after a great battle with Schlenk, finally took the lead. Brian Ruhlman made his presence known late in the race as well as he had his car in the mix for the lead. Marcoullier held on to win his third feature of the year and slightly increased his point lead over Schlenk going into the final month of competition. Schlenk settled for second with Ruhlman in third. 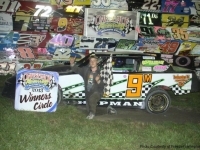 Missler was fourth and Casey Noonan wound up fifth after starting at the very back of the 22-car field. Donovan Paskan started on the pole of the Bomber A Main and could only hold off Jeff Foks to lead one lap. 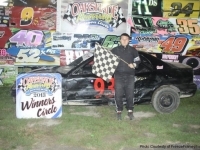 Foks snatched the lead away on lap two and then opened up a big lead over the rest of the field to win his fifth A Main in a row and his sixth of the year. Terry Rushlow finished second and Adam Noonan was third. Paskan wound up fourth and Craig Dippman was fifth after starting 10th. 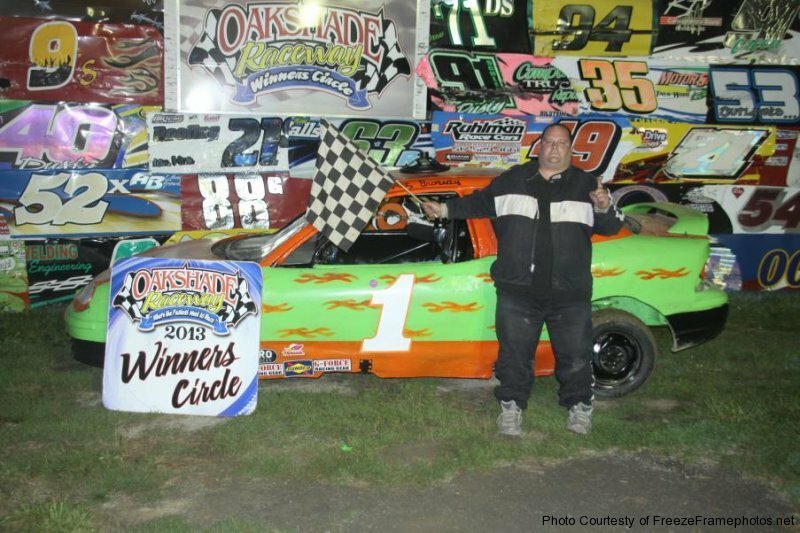 Matt Brazeau and “Sparky Marky” Gillingham put on a show at the front of the Sport Compact feature. Brazeau led the first two laps until Gillingham got by on lap three. The two drivers had some contact during the race and Brazeau battled back and recaptured the lead from Gillingham as Austin Casteneda started to close in. Unfortunately for Casteneda, he would retire to the pits before the finish. 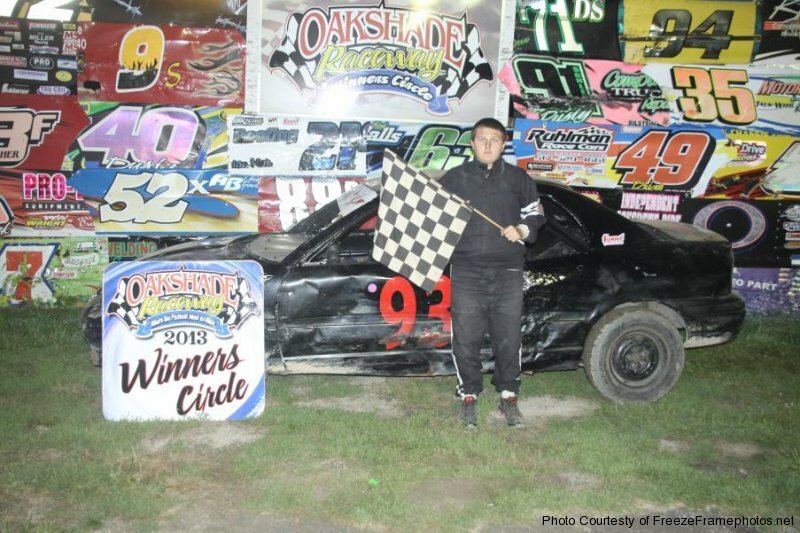 Brazeau was able to hang on to pick up his first Sport Compact feature win over Gillingham, Terry Rushlow Sr., Cory Gumm and Tom Fry. 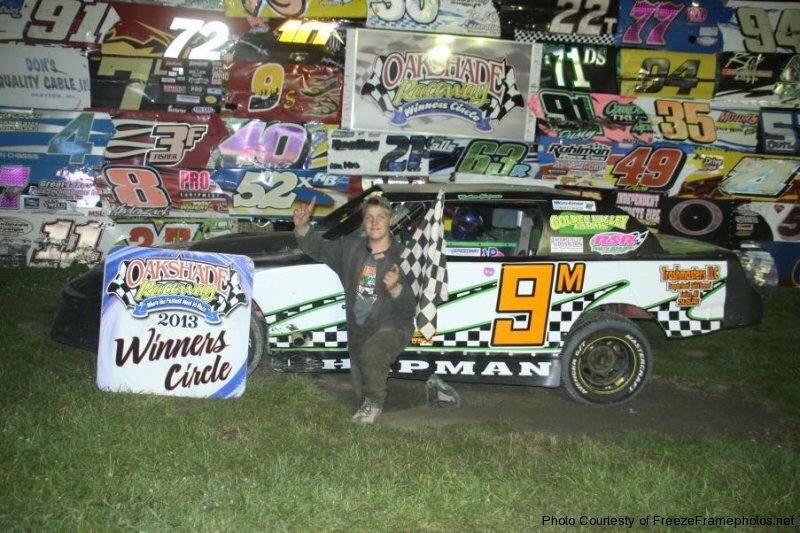 Cody Laney notched another Hornet feature win over John Anderson Jr. and Breanna Franks. 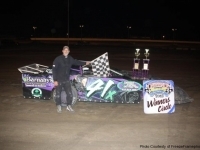 Multiple cautions marred night’s final two features, the Bomber B and C Mains. Bill Reeves Jr. spun on the first lap of the B Main to bring out the yellow flag and at the same time, Tyler Line lost control in front of most of the field and spun in turn four. Shaun Sharp slammed hard into the rear of line and a few other cars got caught up in the big mess which eventually drew the red flag because the track was just about blocked. After the clean up, Mathew Chapman opened up a bit of lead that was wiped out by another caution flag. Late in the race, Chapman got held up behind Anetta Goodman who was running at the tail end of the lead lap. Ted Hill closed in and got to the inside of Chapman on the final lap, but a spin by Taylor Dippman brought out another yellow to set up a one-lap dash to the checkered flag. Chapman was able to hold of Hill to pick up the victory. Dan Plath finished third followed by Jody Burton and Rick Dippman who had to come back up through the field after being caught up in the Tyler Line accident on lap one. 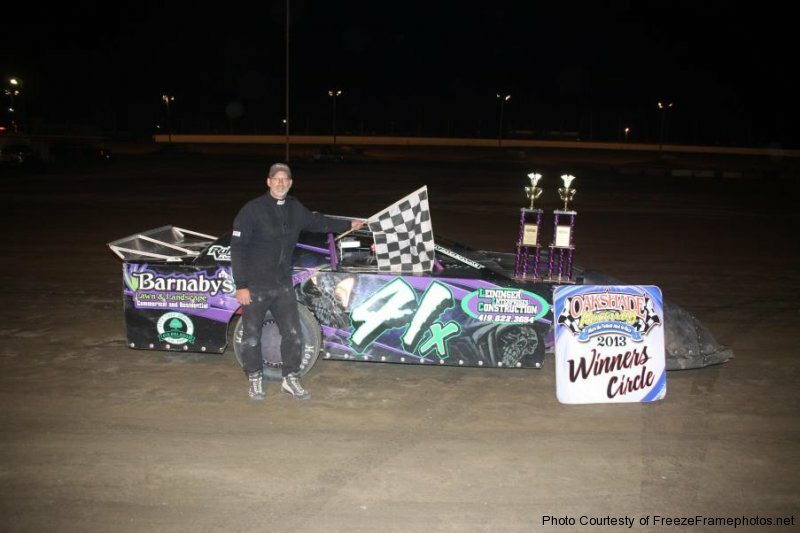 Attrition was a major factor in the Bomber C Main which only had four cars running at the finish. Nathan Goodman led the whole way and picked up the win over Gabe Mueller. Teri-Lynn Murphy and Maverick Wright had a heated battle for fourth most of the race. The two drivers traded paint and positions several times with a side by side finish at end in which Murphy beat Wright by a nose for the third place position. 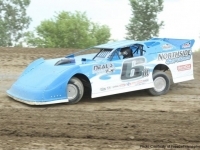 Henry Wall’s Jr didn’t finish, but was credited with a fifth place finish. 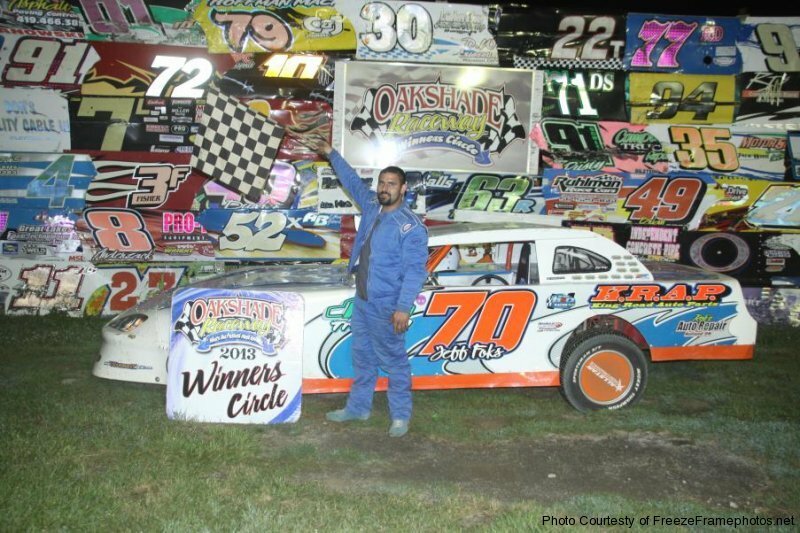 Oakshade Raceway will host the rescheduled 24th Annual Barney Oldfield Race/American Late Model Series which will pay the winner $4900 on Saturday, August 3. Sportsmen, Bombers, Hornets and Sport Compacts will also be back in competition. Gates open at 4pm with racing at 7pm sharp!